It is not my typical Saturday lunch. The autumn air is crisp and clean as I stroll along East 65th Street in Manhattan, towards a cream colored building with an art deco façade. I turn left into a large set of revolving doors with burnished trim. On each glass panel is a cocoa-colored plaque embossed with the name DANIEL. Inside, elegantly dressed women are drinking ruby red sparkling wine in tulip glasses. I quickly spot my friend “Lee Sloan,” a grand dame of food and wine and join her. I’ve learned a lot about the world of food and met a lot of scrumptious foodies, thanks to Lee. She was a pioneering force in the practice of food public relations and helped to establish the organization Les Dames d’Escoffier more than 30 years ago. As she often reminds me, I was just a child back then. Les Dames d’Escoffier is an international organization of women leaders who create a supportive culture in the food, beverage and hospitality professions. The group is named for the famous French chef, August Escoffier. It is the annual Les Dames d’Escoffier induction luncheon. Seven women of distinction in food, wine and hospitality will be welcomed into the organization. We are directed into a handsome gathering room carrying our bubbly red wine. During the ceremony, women are honored in the fields of food journalism, publishing, wine and consulting. Some wander in late complaining of parking challenges and one Dame notes that the bus is perhaps the most reliable form of transportation on a Saturday in Manhattan. With the ceremony concluded we proceed to the sunken dining room to experience Chef Daniel Boulud’s seasonal French cuisine. The décor is a mix of neoclassic columns and contemporary art. Seated at the table, along with Lee are Dames Betty Fussell, Roberta Morrell and Rozanne Gold. Betty Fussell is a writer and food historian I’ve met on a number of occasions. She studies quintessential American foods, has written “The Story of Corn” and just published a history of beef in America called “Raising Steaks.” Roberta Morrell is the owner of a prestigious wine business in New York City. Rozanne Gold was once chef to former New York City Mayor Ed Koch and went on to create the successful series of “Recipes 1-2-3” cookbooks which offer delectable recipes using only three ingredients. The talk of the table is predominantly presidential and vice-presidential politics, as it is almost everywhere these days. The luncheon is akin to being presented with a collection of rare jewels. South Carolina Shrimp with Spiced Carrot Coulis, Lime Gelee, Ginger-Scallion Salad & Whipped Cilantro Cream fairly glistens on the plate – several perfect crustaceans on a sea of deep orange. Pennsylvania Squab, Leg and Foie Gras Pastilla with Young Radishes, Broiled Breast with Vadouvan & Avocado Chutney is deeply earthy and the dollop of foie gras meltingly rich, surrounded by expertly sculpted new vegetables. Cilantro Poached Pineapple with Coconut Cream, Lime-Rum Gelee & Pina Colada Sorbet is a composed landscape of bronze hues and intensely tropical flavors. Chef Daniel Boulud appears at the center of the room dressed in a crisp and immaculate white jacket, with rimmed glasses and dark steely-gray hair. He is one of the world’s most celebrated French chefs. Deliciously charming, he introduces the kitchen staff, and several dozen young men and women in white uniforms enter the room to the enthusiastic applause of the guests. One can sense the esprit de corps of the team at DANIEL. 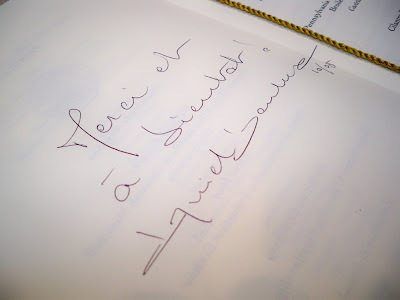 Chef Boulud notes that the women on his staff would make exceptional members of Les Dames d’Escoffier. He then moves from table to table greeting guests individually. After chatting at our table, he invites us to take a tour of the kitchen. He leads us through a side door and we leave the classic elegance of the dining room and enter a world of stainless steel, bright lights and precision. This kitchen is for cold preparation and lunch dishes. Prep stations are arranged in an angular fashion. There are young culinary professions carefully chopping perfect vegetables. A variety of spice canisters are stored on a high shelf that lines the wall, along with small works of Asian art, and there is a large picture window above us. Chef Boulud notes that this is the chef’s dining room. “Anyone can eat up there if they reserve ahead,” he says. He takes us along a narrow corridor and down a series of stairs – a culinary pied piper leading us through his domain. We enter a labyrinthine, subterranean kitchen where a battalion of more than forty kitchen staff are at work, inspecting fine herbs, preparing soup, organizing ingredients and baking bread. We weave through the center of the room. Each work station is just about two-feet-by-two feet. Members of the staff smile and greet us, but never waver from their orchestrated tasks. Chef Boulud explains to me that the kitchen is active for many hours each day with some members of the team beginning work at 11 a.m. to prepare bread, with others reporting in by 2 p.m. for dinner preparation. The ingredients surrounding us are perfection. Chef Boulud stops at a station, picks up a flawless Honey Crisp apple, puts it to his nose and inhales the aroma. We wind through more corridors, past computers and photographs of illustrious guests. I spot framed photos of Chef Boulud with President Bill Clinton and Julia Child before we climb another set of stairs and return to the lobby of DANIEL. It’s going to be tough to go back to Saturday soup and sandwich next weekend. Wow, what a menu! I want some Cilantro Poached Pineapple with Coconut Cream right now. Everything sounds so interestingly prepared. I'm thinking this must have been a very memorable meal. I imagine that any meal eaten in the company of such distinguished dining companions would be memorable. Having that meal at Daniel is just icing on an already very rich cake! Wow, lucky you! I would love to go to Daniel when I go to NY. sounds like a very cool event. btw, have I ever said how much I love your blog logo/header? Wow, a truly amazing experience! Soup and a Sandwich? Well, your have to join us little people again some time!! Your writing just gets better and better! Hey that's my old boss! 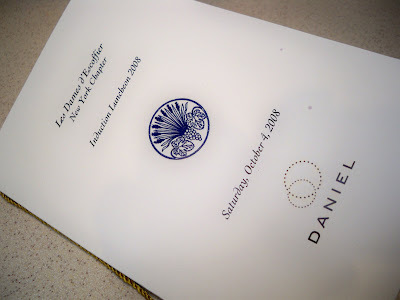 I was part of the opening team when Daniel's restaurant was moved from the Surrey Hotel (where Café Boulud is now) to it's current location. Isn't it the best kitchen ever? I can tell you these chefs work really hard. Such a cool event and the menu sounds amazing. I'm glad you enjoyed it. Kalyn - the pineapple dish was amazing - such an intense flavor. Lydia - They are all Grand Dames, indeed! Veron - Do it - I'll join you! Giff - Many thanks! My cousin, Steve Price is a graphic artist and designed the logo - he did a great job capturing my "theme." Freya - so nice to have you back! I'll add a little chocolate to my soup and salad menu in your honor! Zen - A dream kitchen, I would say. The size of it was amazing - so many people at work. I'm in continuous awe of your circle of dining companions, journeys and meals. Seems like the only one missing (besides me:) was Thomas Jefferson. Now, that's the way to spend an afternoon.